Hurricanes Harvey, Irma and Maria that devastated Texas, Florida and Puerto Rico call for social science research. The hard sciences of meteorology and hydrology have already spoken and deserve credit for good work. Now the soft sciences, which have not yet contributed, need to get to work. Houston, which bore the brunt, has long been criticized in the public administration literature for poor land use planning. Frequently one hears that it is the largest city in the United States without zoning: “Gas stations can be built anywhere” and “industry can be built in residential areas.” Yet Houston looks much like most other American cities. Gas stations are located along big roads to attract customers and industries locate near railroads and waterways for transportation. The big surprise to outsiders was the large number of reservoirs. These were all around the city and caused flooding. No one had fully anticipated their danger. The Federal Emergency Management Agency will come under the lens, especially since it was the scapegoat for blunders in Katrina in 2005. In fact, FEMA performed quite well. It had cached food, water and blankets prior to the storm. Its staff moved in promptly. Its director was Brock Long, who came to the job after directing the Alabama agency and before that served on the FEMA staff. Previously, William Fugate had restored the Agency’s reputation during the Obama Administration. By the time Maria hit Puerto Rico on September 20, however, FEMA’s resources were strained. Governments at the national, state and local levels had improved their coordination. Army, Air Force and National Guard evacuated victims and delivered supplies. There was no hand-wringing over the Posse Comitatus law as in 2005. At least five additional issues deserve examination. One is forcing evacuations. Putting thousands of refugees on the highways without gasoline, food and shelter was often unwise. In Florida Miami evacuees were sent to Naples and Tampa but Irma changed course and hit the west coast. The police role in protecting private property bears examination. Is looting at a grocery store a crime or a means of food distribution? The success of the amateur “Cajun Navy” bears analysis. In Houston, loosely-regulated construction of houses and stores had paved over land that formerly absorbed rain. Government flood insurance is often blamed for encouraging construction in flood prone areas. Cooperation between cities and their suburbs is always ripe for discussion. 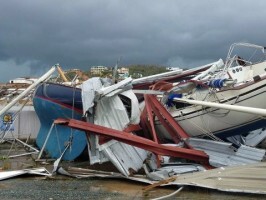 Puerto Rico suffered the most. Legally, it is a commonwealth, a nearly unique status in the US system. The island is not a state and not a colony. Its 3.4 million citizens do not vote for president and have only a single non-voting member of the House of Representatives. The terminology, “commonwealth,” is not even used in Spanish where it is called an “Estado Libra Asociado,” a freely associated state, which it is not. This is a form of federalism never taught in public administration textbooks. Partly due to its fuzzy legal status, the island has difficulty selling bonds, placing it near bankruptcy. Its antiquated electric grid failed. Its water supply failed. The Jones Act prevents ships not registered in the US from delivering supplies. Author: Davis taught environmental policy at the University of Toledo. Email him at [email protected].